We all endure losses, big and small, some more intense than others, and some of us experience more than others, but we all go through it sooner or later. 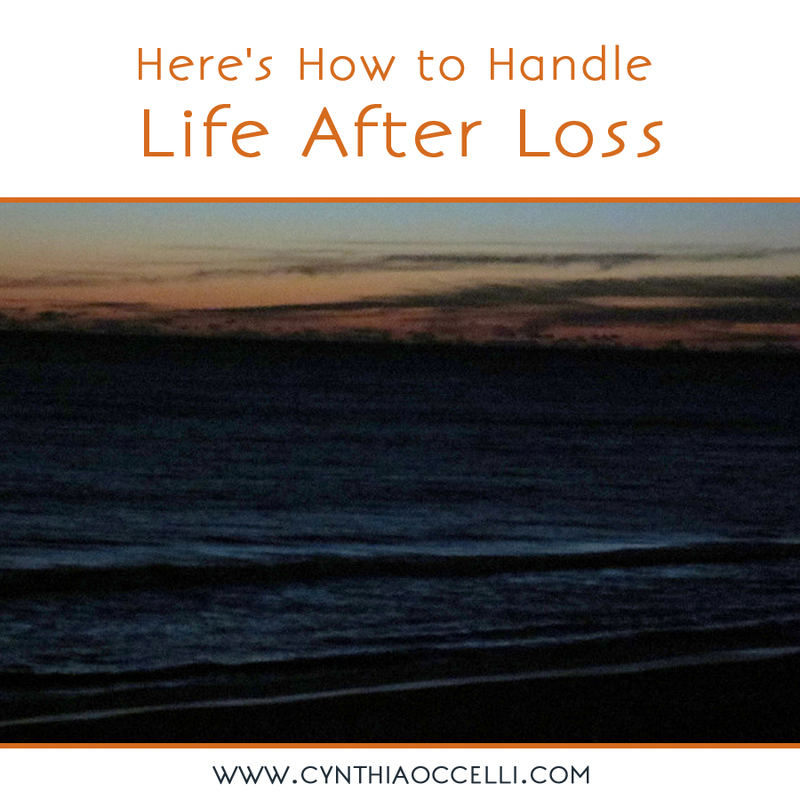 For me, the experience of loss and grief is what I would imagine being dropped out of a plane into the middle of a seemingly endless stormy sea, at midnight, with only a very flimsy flotation device would feel like. At first, it’s shocking and we grapple with trying to understand how it’s even possible that this happened. We think, there must be some mistake, this can’t be real–everything was fine, yesterday, or last week, or last year. It just doesn’t feel possible that this could ever have happened to us. Intermittently, at first, we begin to grasp the magnitude of what’s happened. We feel the cold, the isolation, the hopelessness of it all and then we withdraw back into disbelief or denial. Slowly, over time we realize that what’s happened is real in our experience. Every emotion, any emotion, one can feel is normal at this point: anger and rage, sadness, victimization, despair and agony, utter emptiness and discouragement—all normal. Out there bobbing in the middle of the ocean, we might curse life, God, the people we feel let us down; we often curse ourselves too. We may fantasize about how good our old life was and feel guilty for not appreciating the way it was before, or appreciating the person we lost more (if that’s what’s happened). The days languishing in the water seem endless and we wish and hope and pray that someone will come along and pluck us out of the water. We want to be saved. People do come and some are willing to swim beside us, but no one can pull us out of the sea. It’s our ocean of grief and if we want to get through it (because we can never get over it), if we want to know what it feels like to be okay and on dry land again, we have to swim through it ourselves. And so we swim and when swimming hurts too much we hold on to whatever we can grasp onto wondering if it’s even possible to survive. The nights are harrowing and long. The days are blanketed with gloom and it seems like our ocean covers the entire planet—that land doesn’t really exist. This can be a very long period and though it feels like we’re struggling in place, as long as we’re expressing our emotions in a healthy way, we’re moving towards shore. One day, out of nowhere land will appear on the horizon and the concrete realization that it exists will take hold. We’ll have proof that there is still a life out there for us. We’ll feel euphoric or hopeful and swim hard for shore. Then, just as the land appears to be closer, the sea of our pain sweeps us under pulling us back into its vastness. We think we’re back where we started, lost in the endless ocean, and we feel devastated. This is what processing grief often feels like. A glimmer of good will come and our feelings of loss and sadness will overcome it and pull us under. But, here’s what I know for sure. If we resolve in our hearts to LIVE, to walk on dry land again, the sea’s cycle will continue, it will ebb and flow. 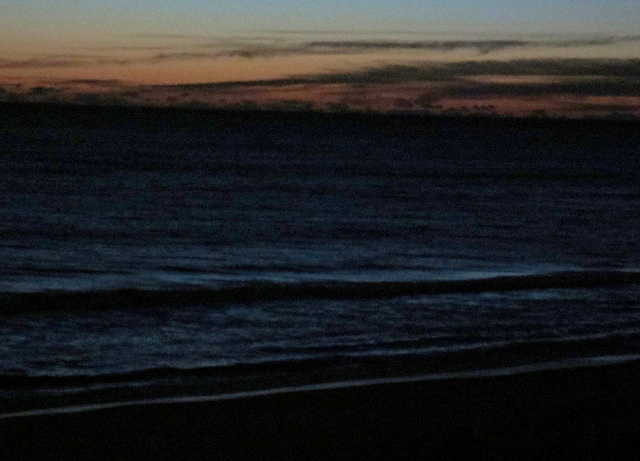 We’ll continue to come closer to the shore, until one day the waves lay us gently on the beach of our new lives. Share your thoughts with me on the comments below. I read all comments and would love to read yours. It’s been three years and I’m still in the midst of it. Not just one thing, but many hardships have occurred. I’ve lost-almost everything-except for myself. I’m still struggling, trying to have hope and move forward, but it is still difficult. I long for…relief. Don’t give up. You yourself are a TREASURE Ruth. Wow…this speaks volumes to me. Roshnee – I am so so sorry. You are right, your life will never be the same. It can be good again though. Just let this be a possibility. You are in the midst of such grief and I wish I could give you a hug. Please be sure you’re connecting with someone you can talk about this with. Don’t go it alone. I’m sending you love. My daughter had several brain injuries due to many V/P shunt surgeries. She was a full time student in college, & working 30 hrs weekly.She suffered tremendous amounts of pain & was close to death. She pulled through, but was unable to talk, walk, & had short term memory. Her personality changed. She was mean spirited. The pain of losing my daughter was unbearable. I was so angry and God, & the Drs. She was hospitalized for 5 months! .I am still dealing with grief, but don’t have anytime to myself. She is doing much better, but still needs care 24hrs/7 days a week. My husband and I rotate shifts with her and no other help.Most of what I am feeling is helplessness,sadness and anger. Thank you for these articles & and the great guidance and suggestions. I know how important it is to release these emotions or they will manifest into a disease. I see now how important it is for caregivers to take excellent care of themselves and not feel guilty about it. Oh Cynthia, this is tragic and the tragedy continues. I strongly recommend reaching out for more help, both with caregiving and with your feelings. A support group would be wonderful. You are spot on with this statement: “I see now how important it is for caregivers to take excellent care of themselves and not feel guilty about it.” Please make this a priority. I am sending you much love and hugs. I remember you sending me this and I went through and still seem to be going through some remembering. But I relate to all you say, and thank you for it always. Time is helping, family is helping, and life goes on. The trick is…will I go on as well. The answer is always yes I will.